In our recent report, “The Governance of Telecommunications Surveillance: How Opaque and Unaccountable Practices and Policies Threaten Canadians,” we discussed how the Communications Security Establishment (CSE) developed and deployed a sensor network within domestic and foreign telecommunications networks. While our report highlighted some of the concerns linked to this EONBLUE sensor network, including the dangers of secretly extending government surveillance capacity without any public debate about the extensions, as well as how EONBLUE or other CSE programs programs collect information about Canadians’ communications, we did not engage in a comparison of how Canada and its closest allies monitor domestic network traffic. This post briefly describes the EONBLUE sensor program, what may be equivalent domestic programs in the United States, and the questions that emerge from contrasting what we know about the Canadian and American sensor networks. The CSE sensor network is composed of a set of interrelated network appliances; INDUCTION has similar capabilities as EONBLUE, and has been deployed domestically at the gateways between domestic and international network domains: CSE documents state that the agency had “100% INDUCTION coverage of main SSO sites + metadata production.” This placement lets the CSE monitor all traffic coming into, and exiting, Canadian Internet space. Other appliances that were deployed include a metadata production and processing program, THIRD-EYE, which operated at selected new sites and an unclassified sensor which was designed to track targets and be deployed in non-highly secured locations (i.e. not in Sensitive Compartmentalized Information Facilities). The decision logic, which is used to generate alerts that malicious activity may have been detected by the EONBLUE sensors, is shared between the American, Canadian, British, Australian, and New Zealand signals intelligence agencies since 2009 or 2010. While this served the goal of facilitating cross-national defence there were later proposals that it could also be used for intelligence collection during discussions about building out the EONBLUE network. Regardless, there was historically a sharing of the logics, and presumably signatures, that the aforementioned intelligence agencies used to detect and respond to potential malicious threats. In summary, EONBLUE is a globally deployed sensor network that includes installations in Canadian networks. 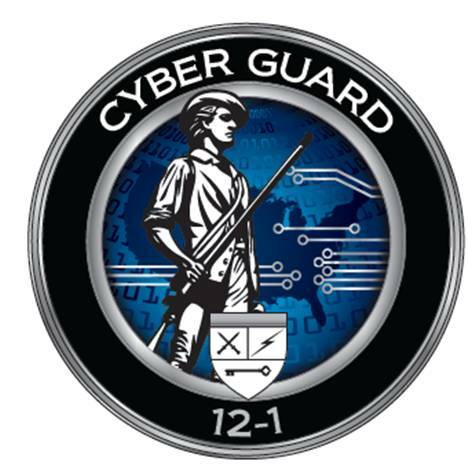 It is part of the CSE’s efforts to detect and respond to potential threats and, also, acts based on information that is shared between closely allied signals intelligence agencies. EONBLUE fundamentally operates as a frontline analyzer of data traffic that can act upon (and modify) data traffic based on policies loaded into its component sensors. The NSA Equivalent(s) to EONBLUE? many cyber threat targets currently cannot be tasked to [FISA Amendments Act Section 702] FAA702 due to lack of attribution to a foreign government or terrorist organization. The new certification will not require this attribution, and rather only require that a selector be tied to malicious cyber activity. The FAA702 collection will then be used to determine attribution, as well as perform collection against known targets. The NSA documents do not provide a comprehensive example of all types of signatures that would be monitored for by the agency’s sensors; the signatures would include “IP addresses, strings of computer code, and similar non-email or phone number-based selectors.” The NSA would monitor for these signatures at Special Source Operations (SSO) locations. In this use, SSO refers to companies that have integrated these NSA sensors into their infrastructures and, in the case of the documents discussed by the NYT, include American telecommunications companies. Based on the NYT reporting and the documents themselves, we know that the NSA expected to capture large volumes of data associated with digital signatures. As an actor used malware or other technique to extract data, both the signature and presumably related data (e.g. registering it was malware type X and copying data relevant to the malware’s technical operation) along with exfiltrated data was identified by the NSA sensors and subsequently sent to a database for additional analysis. Lawyers advising the NSA warned that any exfiltrated data — which was taken from US government agencies or US-based companies — that was stored would likely to contain significant volumes of American citizens’ data. The rationale for collecting this large volume of personal information was to identify the likely actor(s) behind an attack. By analyzing the full volume of exfiltrated data clues about who was responsible, or why that data set was targeted, might become apparent. [b]ecause this type of exfiltrated data potentially can contain so much [United States Person] information, [the Office of General Council] advises that this type of exfiltrated data be segregated from the rest of the [signals intelligence] raw traffic and is made availabe only to those who have the mission to collect/report on these types of foreign intrusions. The exfiltrated data does not contain any [foreign intelligence] other than what is reported in order to understand what the foreign hacker was seeking, and what the foreign hacker obtained for damage assessments. It remains unclear whether this advice was adopted by NSA analysts in practice, as well as whether the same guidance would be given today based on the contemporary state of US law, the Department of Justice’s and Office of the General Council’s present interpretations of law, or relevant changes to US government policies. Perhaps most surprising is the degree of autonomy given to SSOs in determining whether the FBI should enjoy access to the NSA’s Commercial Off The Shelf (COTS) sensors. SSOs “will make careful and informed decisions” prior to letting the FBI use COTS that “involve components developed at NSA’s expense and used, primarily, for NSA’s Cyber survey purposes.” There is no suggestion in the memo that the FBI would receive access to the NSA’s Government Off The Shelf (GOTS) intelligence collection and processing infrastructures which have been deployed into American telecommunications companies’ networks. The document does, however, indicate a higher than previously assumed level of corporate responsibility for facilitating government surveillance: in deciding whether to authorize use of NSA equipment SSOs are transformed from receiving an order to conduct domestically-warranted interceptions into actors who are involved in negotiating the mechanisms for interception in order to defer costs and inconveniences to law enforcement organizations. designed to stop attacks before they reach government computers. The five major Internet service providers — Verizon Communications Inc., AT&T Inc., Sprint Corp., Level 3 Communications Inc. and CenturyLink Inc. — use it to sniff the huge volume of data moving to and from sensitive networks and then use digital signatures to spot and delete hackers’ tools. telecommunication companies would route data going to and from government networks through an NSA monitoring box, which would examine the traffic for malicious code or suspicious activity suggestive of a network attack. Einstein 3 represented a major change. Einstein 2 monitors communications at the federal network access points. In Einstein 3, agency-bound traffic is diverted to an intrusion-prevention system. The communications are searched using NSA tools and hardware. Traffic matching known or suspected malware will be blocked … Einstein 3 differs from its predecessors in that it is designed to check packet content in addition to transactional information. Privacy concerns were prominent even in 2009, with the then-Secretary of the Department of Homeland Security asserting that the NSA’s technical resources “will be guided, led and in a sense directed by the people we have at the Department of Homeland Security.” It is not clear whether the EINSTEIN 3 system is linked to the sensor networks mentioned in the NYT article though, if not, then sensor networks with parallel capacities and purposes have been established by the NSA within major US-based telecommunications infrastructures. It isn’t immediately apparent how the four ‘types’ of EONBLUE sensors (i.e. EONBLUE, INDUCTION, THIRD-EYE, and CRUCIBLE) directly contrast against the NSA’s COTS and GOTS sensor systems. Nor is it clear whether particular types the EONBLUE system, or the NSA’s COTs and GOTs systems, have a direct parallel with the EINSTEIN 3 sensor network. 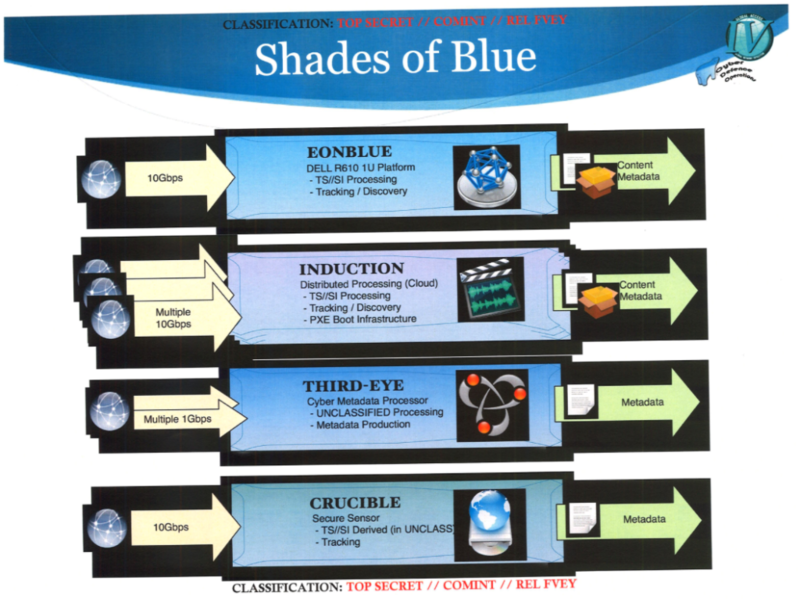 What is clear, however, is that the NSA must be analyzing traffic using an equivalent of the EONBLUE system. We know that CSE and the NSA have, in the past, shared threat information with one another so that data collected and parsed by sensors such as EONBLUE could be rapidly interrogated using shared decision logics. No Snowden documents have clarified the extent to which these shared logics are automatically integrated into non-Canadian sensor systems; thus, while it is possible that information generated by Canadians for EONBLUE are subsequently integrated into EINSTEIN 3, as well as the COTS and GOTS systems, and vice versa, we lack the documents that would positively confirm this hypothesis or clarify the rapidity at which decision logics are integrated into the parters’ sensor systems. The NYT article sheds light on how the NSA and FBI interoperate and use the same sensors. There is no evidence in the Canadian-based Snowden documents that CSIS or other Canadian federal agencies enjoy the same degree of access to EONBLUE sensor systems as the FBI does to NSA sensors. However, memorandums of understanding have shown that CSIS and CSE are deeply interoperated with one another and we know that CSIS can obtain warrants (under Section 16 of the CSIS Act) that are then fulfilled using CSE equipment: just as the FBI requires a warrant before it can task network sensors built for the NSA, CSIS requires a warrant before CSE’s systems can be activated to track specific persons for Canadian Security Intelligence Service. Ultimately, then, while the NYT article and accompanying Snowden documents reveal more about how telecommunications traffic is monitored and analyzed, we are left primarily with better-informed questions as opposed to answers concerning the sharing of rules or logics that trigger domestic sensor networks to collect domestically-originated data, whether EINSTEIN is linked with the COTS and GOTS systems referenced, or whether CSIS and the FBI enjoy similar access to sensors their respective signals intelligence agency has embedded in domestic telecommunications infrastructure. Nevertheless, even the limited transparency afforded by the latest tranche of documents is helpful in advancing our understand contemporary domestic and foreign intelligence operations that target domestic telecommunications traffic. And the secrecy with which these sensors have been deployed continue to emphasize the need for governments to be more transparent about how they monitor telecommunications traffic, why, and what is done with the monitored information. Research for the report, “The Governance of Telecommunications Surveillance: How Opaque and Unaccountable Practices and Policies Threaten Canadians,”was funded through the Canadian Internet Registration Authority’s .CA Community Investment Program. Through the Community Investment Program, .CA funds projects that demonstrate the capacity to improve the Internet for all Canadians. The .CA team manages Canada’s country code top-level domain on behalf of all Canadians. A Member-driven organization, .CA represents the interests of Canada’s Internet community internationally. It’s actually two diefrfent issues. The program is mainly about conducting traffic analysis, which the most simplistic example would be finding traffic in- or outbound from an IP address known to be used by Al Qaeda. Of course, that would also capture traffic of Americans who simply decided to view an Web site, whether they knew it was Al Qaeda-related or not.Skype traffic is routed, even if peers do the routing, so it can be tracked for purposes of traffic analysis. P2P doesn’t offer any significant advantages, since the traffic travels over backbones known to be monitored by the NSA.Then, the NSA selects traffic of interest for more analysis, which may include decryption, if it is encrypted.The second part of the question is whether the Skype encryption is secure. The answer to that question is a matter of conjecture, but I’d say no. Skype uses a U.S. government-used standard, AES, which has a 256-bit key size, but we have to assume that: a.) The NSA has massive amounts of computational power to crack messsages they select (traffic analysis, per above, lets them apply that computational power more efficiently), and; b.) As a U.S. government-approved code, AES is suspect, because there is always the hubris in government that they can put backdoors in code because only we will know how to use them and, otherwise, the message is secure. That’s the old only the guilty need to worry argument. This has repeatedly proved to be the case with public encryption standards offered by the U.S. government.